Located at the fringes of the city of Chidambaram, the Thillai Kali Amman Temple is a prominent tourist spot. It is a Hindu temple where devotees come to worship the Goddess Kali. King Kopperunjingan of the Chola dynasty built this fantastic temple and dedicated the same to Goddess Kali, the deity of destruction. Many folklores revolve around this temple involving the Goddess Kali and Lord Shiva. According to the local people, the temple is almost 900 years old. The temple is vibrant and a lot of people come to worship the Goddess here regularly. To witness Hindu worship rituals and to seek the blessings of the goddess, you can definitely pay a visit to this temple with your family. Create a customized plan for your visit using the Chidambaram trip planner. You can use ready templates or start from scratch for the same. Curated Chidambaram vacation packages await! Book the best ones and start turning your dream into reality.Discover various ways for how to reach Chidambaram and complete the booking by choosing your mode of transport. 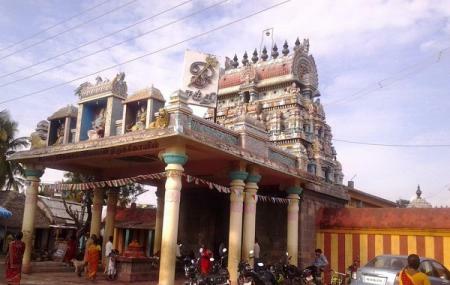 Temple is situated in calm area. Large number of devotees are gathering here. Good Kali temple, smaller in area. They better reduce the amount of kumkumam they give to devotees. Excess is thrown away all over the temple and this causes the red color and stain to stick to the attire along with the oil stains from the spill of ghee lamps.